Lockerbie (Dryfesdale) Cemetery is about one mile west of the town centre on the A709 road to Lochmaben and Dumfries. There are 19 Commonwealth War Graves in individual plots throughout the cemetery. The O.S. reference is NY 122 812. 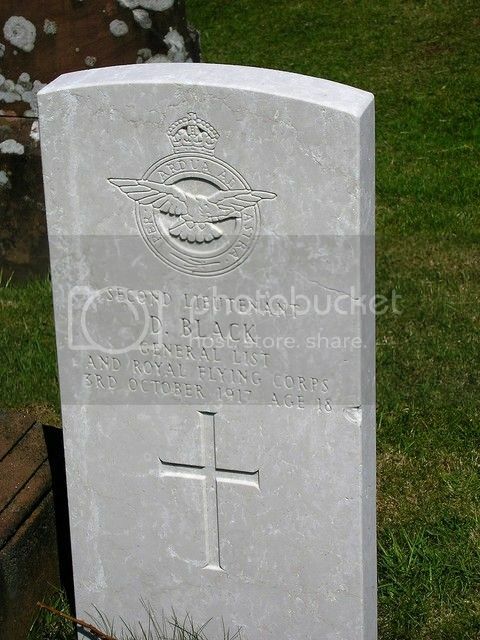 Additional Information: Son of the late Robert and Jane Baillie, of Lockerbie. 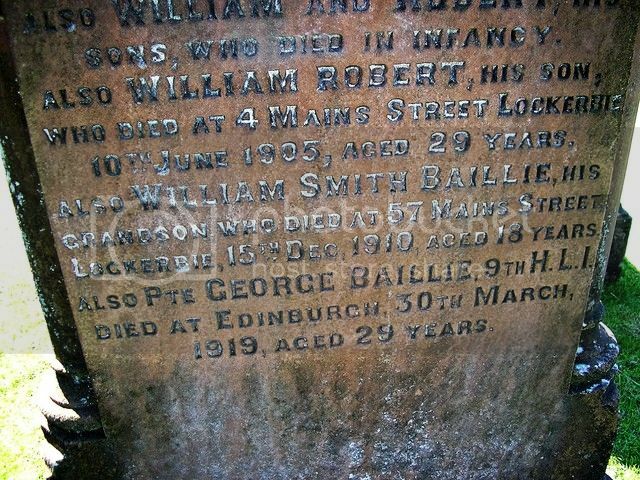 Georg died of influenza and pneumonia at 6 Waverley Park Terrace in Edinburgh while awaiting demobilisation. Grave Reference: North Extn. Grave 888. 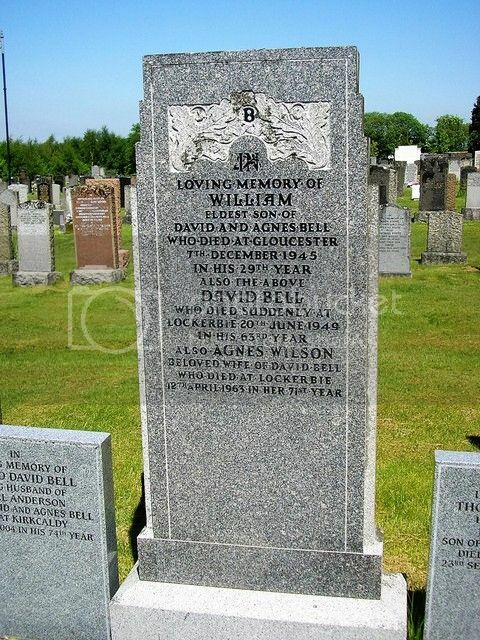 Additional Information: Son of David and Agnes Bell, of Lockerbie. “Billy” died in Standish Sanatorium in Gloucestershire. David was commissioned to the RFC on 5 July 1917 and was on his first flight with a Training Squadron when his aircraft crashed near Lincoln. Grave Reference: North Extn. Grave 885. 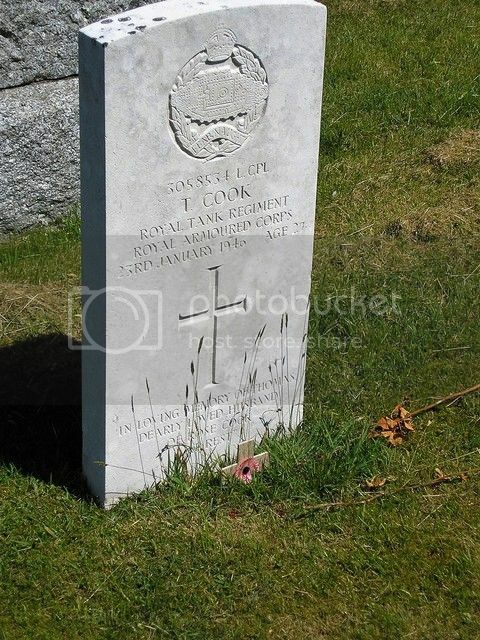 Additional Information: Son of Thomas Cook and of Jeannie Cook (nee Beveridge); husband of Rose Cook (nee Smith), of Lockerbie. 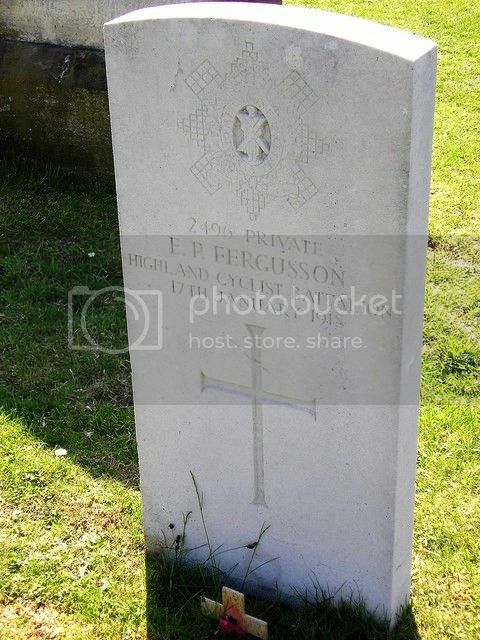 Edward Petrie Fergusson was a plumber in Lockerbie when he enlisted in 1916. He died in Stockport, Cheshire. Grave Reference: North Extn. Grave 466. 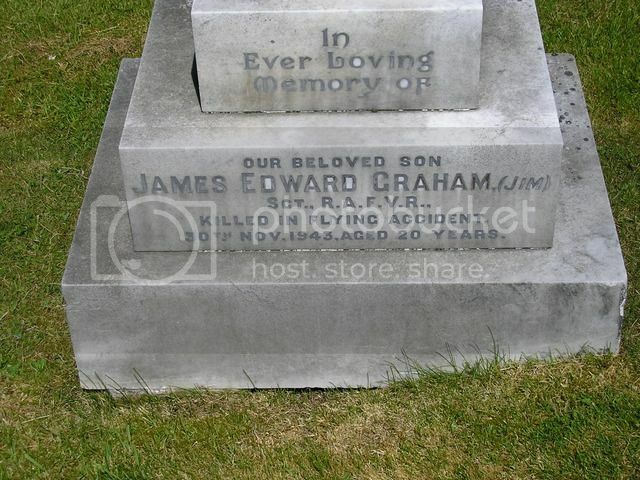 James was fatally injured in the crash of a Wellington bomber of No.14 Operational Training Unit at Orton, Kettering, Northamptonshire. Regiment/Service: Home Guard 1st Dumfriesshire Bn. Grave Reference: North Extn. Grave 9. 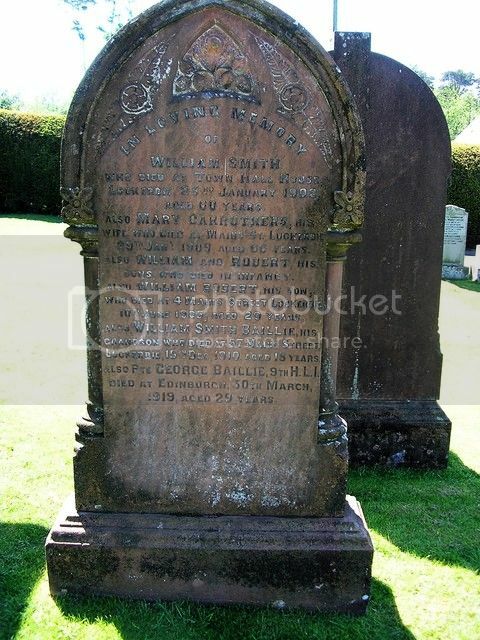 Additional Information: Son of George and Mary Coupland Graham; husband of Isabella Graham, of Lockerbie. 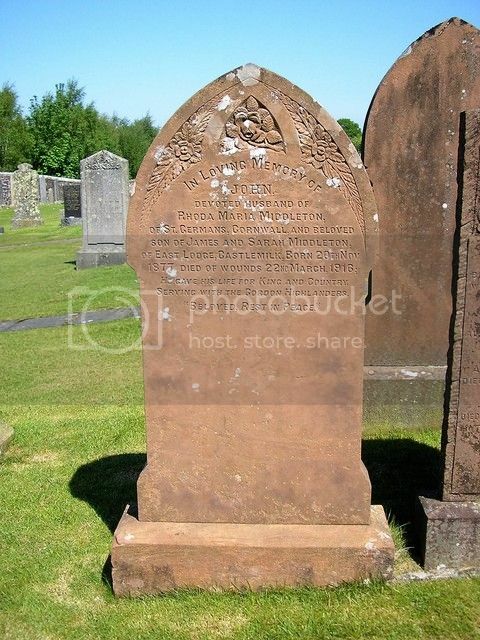 Thomas was a cabinetmaker and upholsterer who served his apprenticeship in Dumfries. He came to Lockerbie after he left the army in 1919 and set up his own business in the High Street in 1926. He had served in the South African War with the Galloway Volunteers and he joined the Territorial 5th KOSB in April 1908. He was mobilised in August 1914 and landed with the 1/5th Battalion at Gallipoli as Sergeant (2051) in June 1915. He later served in Egypt and in Palestine, where he was wounded at Gaza, before the battalion moved to France in April 1918. Because of his wounds Thomas was discharged from the army in May 1919 and he was awarded a Silver War Badge (No. B233797) He was 40 years old. With the formation of the Home Guard in WW2 he became a Second Lieutenant and rose to the rank of Major. He became ill during a “Wings for Victory” parade in Lockerbie and died a few hour later. Grave Reference: North Extn. Grave 856. 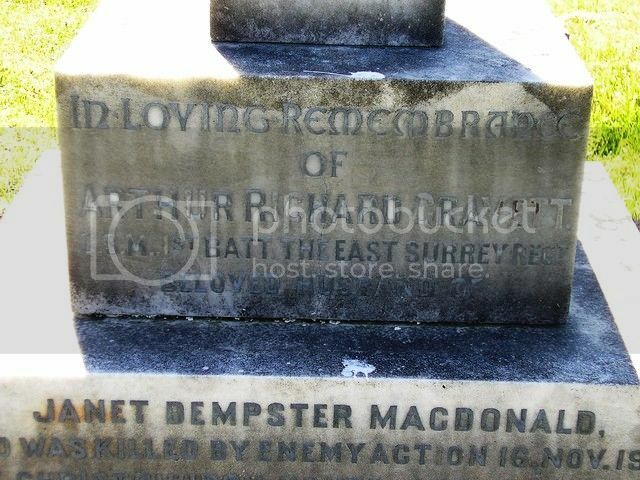 Additional Information: Son of John and Emily Elizabeth Gravett; husband of Janet Dempster Gravett, of Brora, Sutherlandshire. 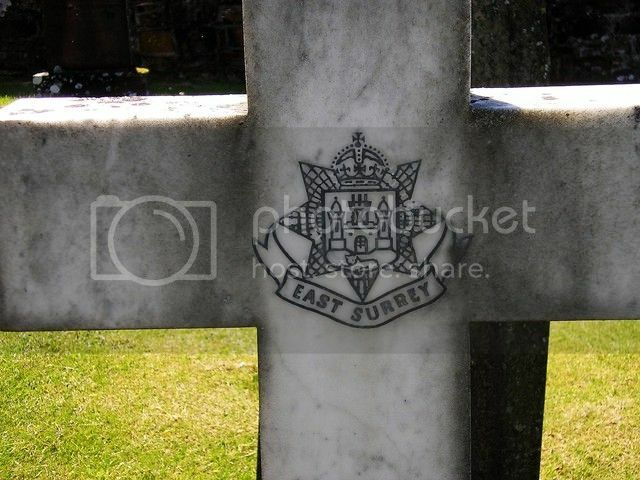 Arthur was a "regular" soldier who had joined the East Surrey Regiment in 1922. He had gone to France with the BEF and had been lifted from the beaches at Dunkirk only to be killed during an air raid at Christchurch near Bournemouth. 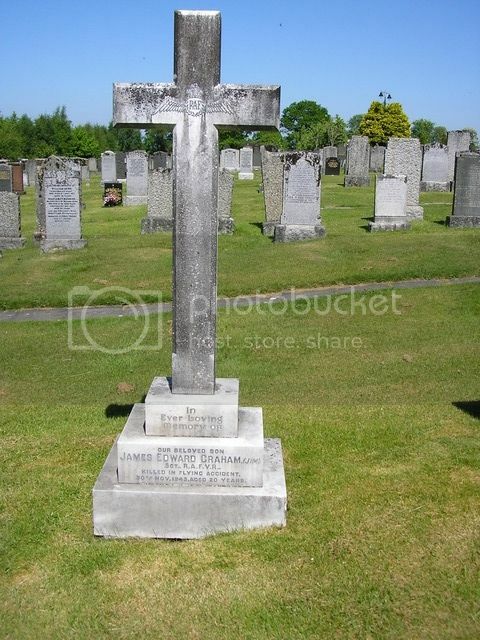 His wife Janet was living with her brother in Lockerbie and so Arthur was buried here. Regiment/Service: Canadian Infantry 1st Bn. 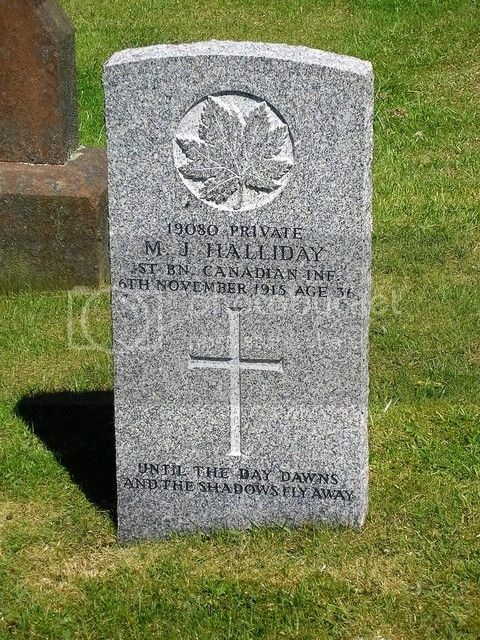 Additional Information: Son of Mrs. Janet Irving Halliday. Awards: D C M, M M.
Regiment/Service: Royal Scots 1st Bn. Grave Reference: North Extn. Grave 840. 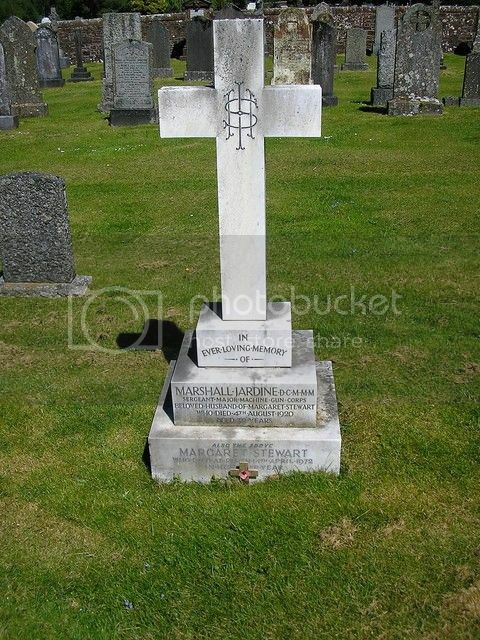 Additional Information: Son of William and Bessie Johnstone; husband of Elizabeth Johnstone, of St. Mungo. 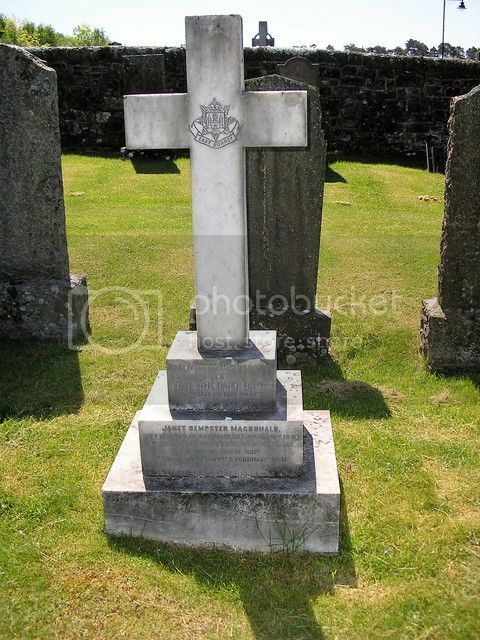 Additional Information: Son of Mrs. M. Johnstone, of Lockerbie. Regiment/Service: Gordon Highlanders 3rd Bn. 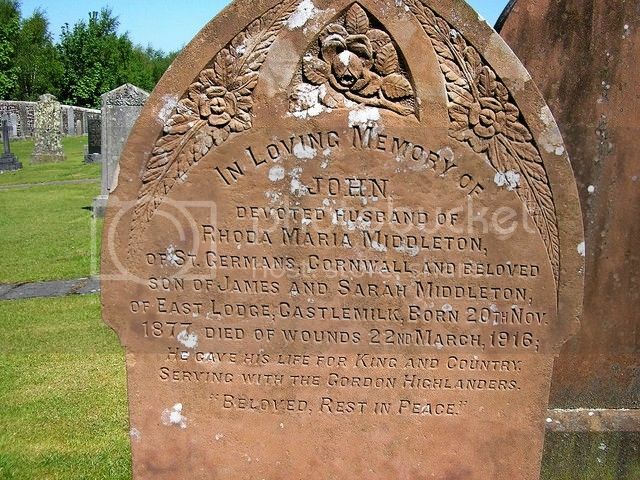 Additional Information: Son of James and Sarah Middleton, of Lockerbie, Dumfriesshire; husband of Rhoda Maria Middleton, of Hessenford, Cornwall. Served in the South African Campaign. 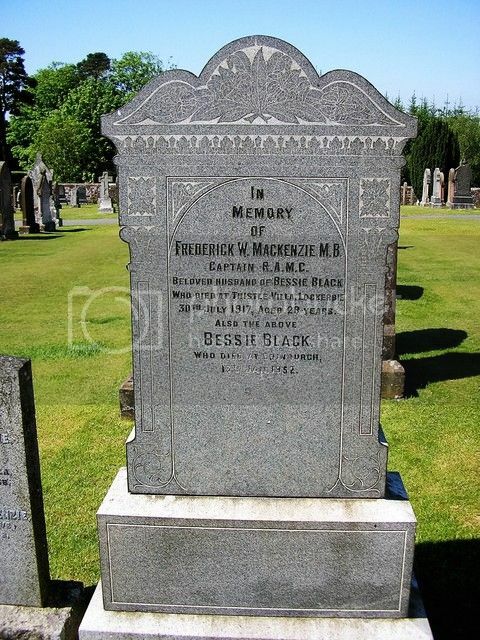 Additional Information: Son of Michael and Margaret Ormiston MacKenzie, of Lockerbie; husband of Elizabeth Black MacKenzie, of Thistle Villa, Lockerbie, Dumfriesshire. Regiment/Service: King's Own Scottish Borderers 5th Bn. 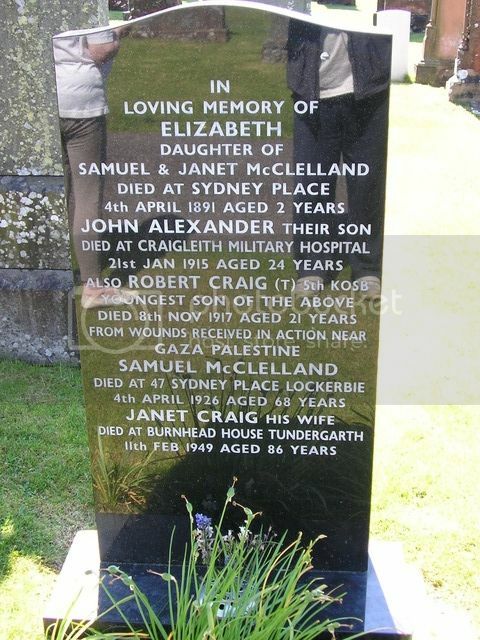 Son of Samuel and Janet McClelland, of Lockerbie. Regiment/Service: King's Own Scottish Borderers 1st/5th Bn. Grave Reference: II. A. 11. 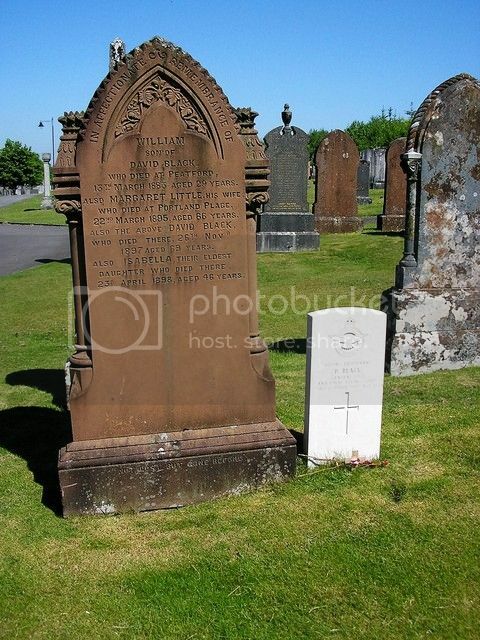 Additional Information: Son of Samuel and Janet McClelland, of 47, Sydney Place, Lockerbie, Dumfriesshire.